We're continuing the tour of Peckerwood Garden in Hempstead, Texas just about two hours east of San Antonio. Part One covered the expansive arboretum and shady woodland garden. Now we've arrived at the gardens near the house. We left off with a glimpse of a brightly blooming azalea through the trees. Rounding the turn toward the house it comes into full view. Rows of trimmed azaleas along a foundation or bordering the lawn are a familiar spring sight in my hometown of Houston. 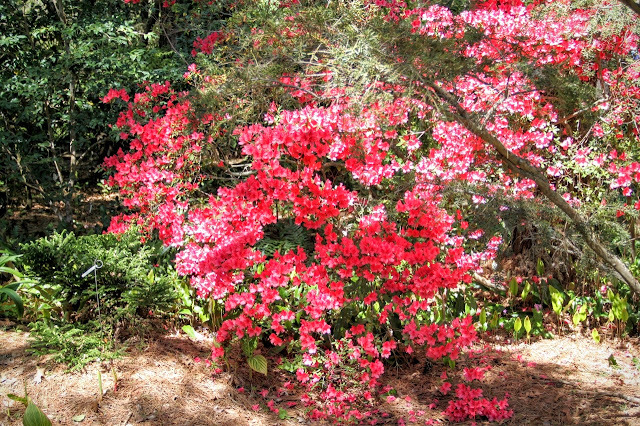 With so few flowering plants in the garden just one solitary azalea allowed to grow full among the trees makes a strikingly bright accent. Peckerwood Garden. It's an odd sounding name unless you are familiar with its story. Named for Peckerwood Plantation in the story Auntie Mame, it's home to John Fairey, artist, architect, and plant collector, who has been instrumental in bringing many popular spiky plants to market. 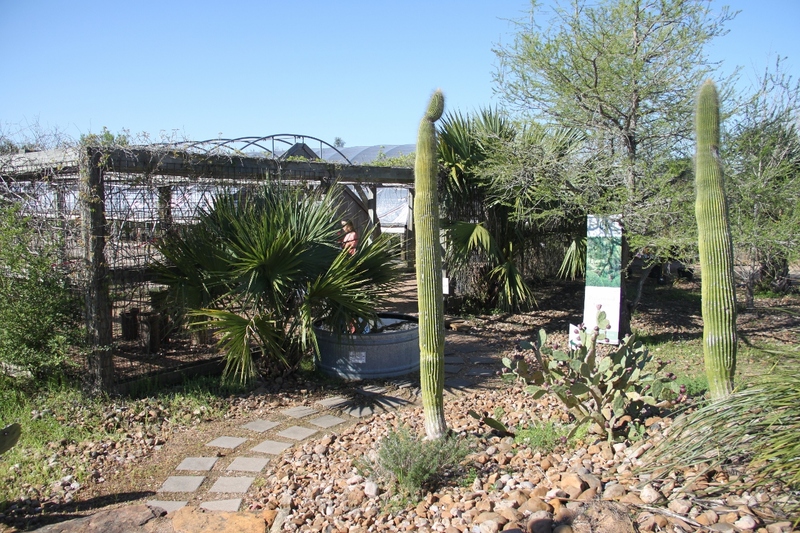 He and plantsman Lynn Lowery made numerous plant hunting trips to Mexico in the 1970s and 80s. For many years a private home and garden for Mr. Fairey it's now a public garden and beneficiary of The Garden Conservancy Open Days program. In late March we arrived for one of Peckerwood Garden's Open Days tours. Spiky entry garden is courtesy of well-known mail order nursery Yucca Do founded by John Fairey on the site. Peckerwood acquired the property several years ago when Yucca Do relocated which added 20 acres to the gardens for a total of 39 acres including parking, offices, and greenhouses which are now used by the Peckerwood Garden Conservation Foundation. One of the first things I do upon arriving in the kitchen each morning is look through the back windows to see what's going on in the yard. 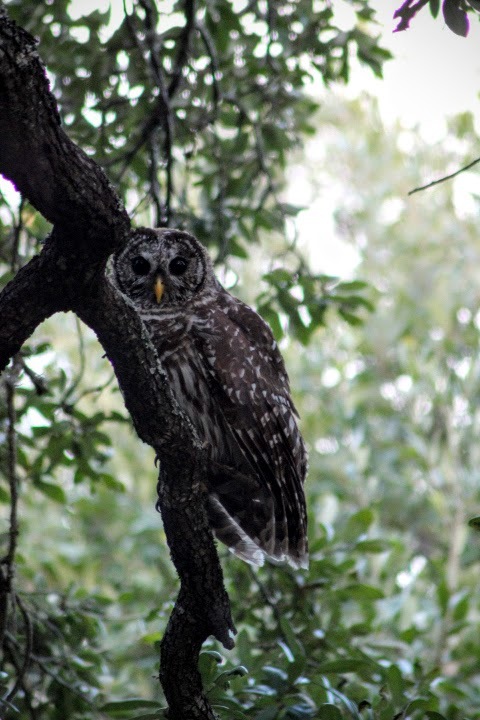 That habit paid off beautifully yesterday morning when I spotted this Barred Owl looking back at me from about 30 feet.